You Can’t Stop The Dame Train! Damian Lillard has the name of the first born of the devil. And there was hell to pay for the Curry-less Golden State Warriors last night in the City of Roses as Dame showed the team with the chef sent back to the kitchen real heat. On the menu the last meal was served as Portland blazed the Dubs 120-108. Bringing the series back to a 2-1 stand, set for a make (equalize) or break (on the ropes) Game 4. And leading the trail for the PDX was Lillard whose 40 points off 8 threes and 10 assists led the Trail Blazers to be the only team to beat the 73-season win record making, Bull beating Warriors twice this season. One in the 82 and now one in the playoffs to halt Golden State’s classic run of instant vintage. The NBA’s Most Improved Player C.J. McCollum had 22 points, to go with another rising star Al Farouq Aminu’s 23 and 10. Whilst for G.S.W it was Dray and Klay day as Thompson had 35 points to go with Green’s 37…but they weren’t celebrating on this night. Neither was Steph Curry with the suit and tie court-side, dressed for the occasion. 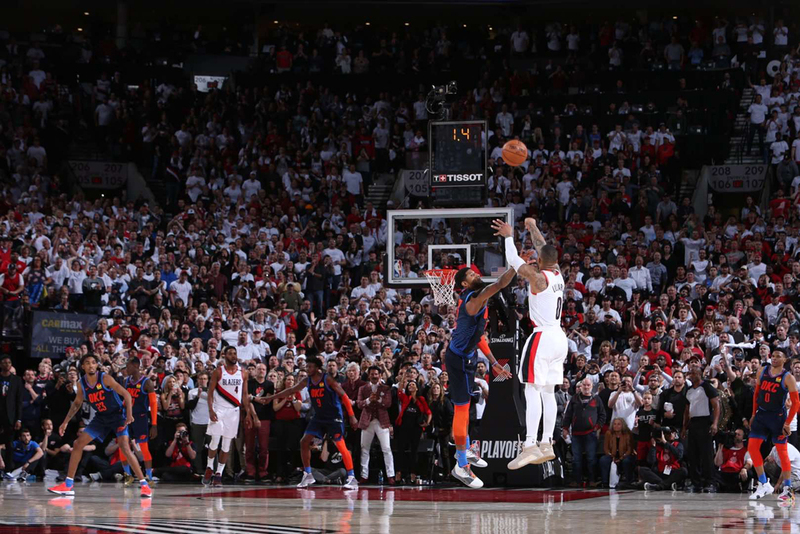 As it was Downtown Dame who gave the Moda Centre crowd what they wanted and waited to see from him. As this rapper/ball player wrapped up the win and drew first, real Rambo blood from the Warriors. If you make God bleed than the world will cease to believe him and this Daredevil was pouring in the points, as the Warriors bled from his thousand cut daggers. 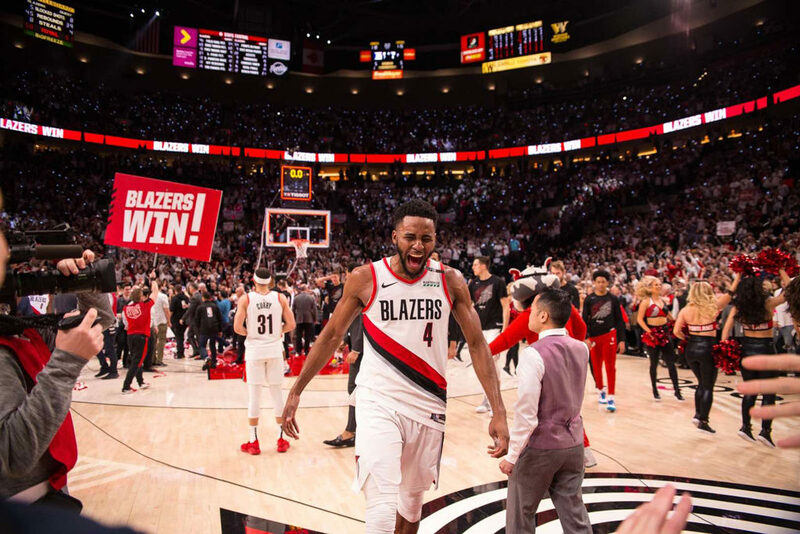 The California kings couldn’t stop the hemorrhaging or the rain as Lillard scored and scored as the Portland Trail Blazers soared in hoop loving Oregon. Keeping his weird and wonderful city in this series, wearing the classic RIP uniform, one of the leagues most underrated superstars suited up, rolled up his sleeves and went to work. 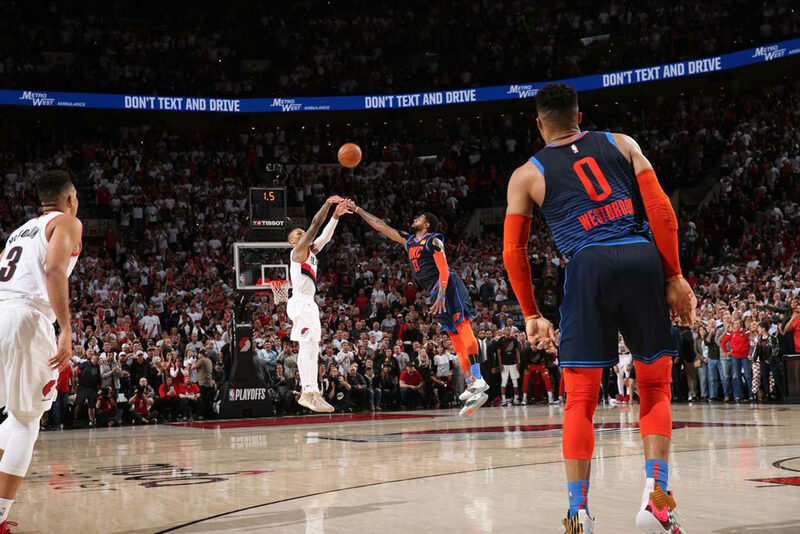 With his former teammate LaMarcus Aldridge making his new San Antonio Spurs the team to beat out West (not the Warriors) Dame went it all alone against an army of three-point gunners, shot eight of his own and couldn’t be stopped like a bullet train out in Tokyo, Japan missing a stop. But in one of the best destinations of these United States, the zero hero from nothing wore Rip City on his proud and puffed up chest and gave his last breath as he left roses outside the door of Golden State’s locker room. Call it. Call it what it is. The Warriors still have the advantage up by one, but Portland have home court and it really is a series now. One hell of one. With the chef off sick the devil is about to make Portland Hells Kitchen like The Punisher. One batch…two batch…penny and dime! BANG! This epic face off contest between the second coming and the son of a gunner is shooting straight to show heaven really is on the hardwood now. You better get to know Damian. He’s about to make sons out of a lot more to come. Father don’t forget him again. “My life came full circle at the park was throwing left hooks/Now I’m in the league with Steph Curry and Russell Westbrook/Took a couple bumps boy you never would see my chest shook/My heart came from a lion this path only the best took/I wanna check the critics cause all they things they nitpick/They always seem to skip where he started his ascension”-Damian Lillard: ‘Soldier In This Game’. For want of a better phrase…Word!